Snowfall; SCA; temperature; Himalaya; climate change. Snow is an essential resource present in the Himalaya. Therefore, monitoring of the snowfall changes over a time period is important for hydrological and climatological purposes. In this study, variability of snowfall from 1976–2008 were analysed and compared with variability in temperature ($T$max and $T$min) from 1984–2008 using simple linear regression analysis and Mann–Kendall test in the Satluj Basin. The annual, seasonal, and monthly analyses of average values of snowfall and temperature ($T$max and $T$min) have been carried out. The study also consists an analysis of average values of annual snowfall and temperature over six elevation zones (&lt;1500 to &gt;4000 m amsl). During the study, it was observed that the snowfall exhibited declining trends in the basin. The snowfall trends are more sensitive to the climate change below an elevation of 4000 m amsl. Over the elevation zones of 3000–3500 and 4000–4500 m amsl, positive trends of mean annual values of snowfall were observed that may be due to higher precipitation as snowfall at these higher elevations. Although, both negative and positive snowfall trends were statistically insignificant, however, if this decreasing trend in snowfall continues, it may result in significant however, changes in future. Furthermore, the $T$min is also increasing with statistically significant positive trend at 95% confidence level for November, winter season, annually as well as for the elevation zones of 2500–3000, 3000–3500, and 3500–4000 m amsl. There are dominantly increasing trends in $T$max with negative trends for February, June–September, monsoon season, and for elevation zone &lt;1500 m amls. It is important to state that in the present basin, during the months of winter season, most of the precipitation is produced as snowfall by the westerly weather disturbances. Thus, the declining nature in snowfall is concurrent with the positive trends in temperature particularly $T$min, therefore, reflecting that the positive trends in $T$min may be the dominant factor besides $T$max in controlling the snowfall trends. The snowfall data were also compared with SCA and this showed a highly positive correlation of 0.95% which validates the utilisation of time series of snowfall for the trend analysis. 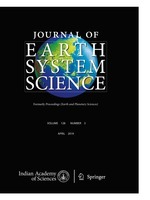 Department of Earth Sciences, Indian Institute of Technology, Roorkee 247 667, India. Geological Survey of India, State Unit: J&K, Srinagar, 190 008, India. National Institute of Hydrology, Roorkee 247 667, India. Indian Institute of Remote Sensing, Dehradun 248 001, India.